This years ride is special it is the Tenth annual ride of the multidaymen. What started out as a ride round the dales on second hand cheap bikes has now become an annual event, a website, nicknames and of course our famous logo The Multidaymen. So this year had to be a bit special and I think we achieved it. Since completing the End to End. We have commenced the Alphabet rides so in keeping with the theme we continued our Alphabet rides with a little poetic licence C to E which was to become Corbridge to York (Eboracum) the Roman name for York. 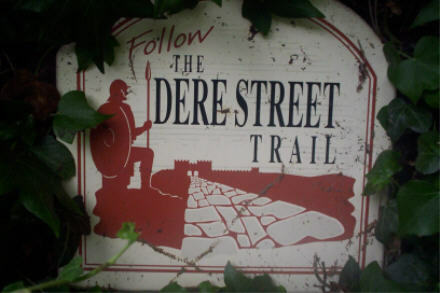 We are riding North to South Berwick being the most Northerly town in England, plus The Roman road theme has developed we have followed Dere Street the ancient Roman Road which plugs into Ermine street another Roman road. Plus a railway theme intrigued read on. This years ride was agreed Corbridge (A Roman Frontier town to York Military Capital of the Northern Roman Empire) the logistics were a little different as we decided to have a celebration in York with wives and girlfriends, after the ride. After a few e mails and a little planning no accommodation to book this year only the Hotel in York, and a couple of phone calls everything was in place. Because of the lack of planning and contact this year’s ride was appearing to be a low key affair I could not have been further from the truth. The logistics were easy as this year we decided to ride via Colin’s house and my house and into York, so once the Hotel was booked for the night of 30th June I just worked back from there. Graeme arrives at my house Marton le Moor North Yorkshire around lunch time. It was a lovely sunny day and we had a few hours spare I was already kitted out and decided to pack everything in my panniers as normal made life a lot easier. Graeme thought this was a good idea so re arranged his kit and did likewise. We decided to have a short leg stretch before driving up to Bishop Auckland for the night. A steady 23 miles. En route Graeme took in views of the distant dales; most of this ride was virgin territory for him. We saw a strange site in the deer park a deer bathing in the lake so tame we were riding past it never moved? We had a few laughs and looked forward to the ride ahead over the next few days. We were back at my house for 430pm and we loaded Graeme’s car with bikes and panniers and drove the 40 miles north to Bishop Auckland. Got to Colin’s and Karen’s around 7pm just before Mum and Dad arrived. We had a pleasant evening Chatting and Karen had done a wonderful buffet especially the beef and onion sandwiches. Around 11pm we all retired already for the great adventure.